Una and remains their primary caregiver. UNA is proud of our volunteers and fundraisers who make it possible for us to have the only live lion mascots in the United States currently living on campus. Donate NowYour donation is needed to help care for Leo III and Una. All of the funds for the care and feeding of Leo III and Una, along with the operation and maintenance of their habitat, come from from donations and sponsorships. Leo was born April 14, 1973 in Knoxville, Tennessee. On July 22 of that year, University President Dr. Robert Guillot acquired Leo and brought him to UNA. Leo lived in the Guillot’s garage until the first habitat was completed on campus. After his arrival, Leo grew quickly from a shy 35 pound cub to nearly 500 pounds as an adult under the care of Dr. Phil Davis, his veterinarian. Leo’s first real birthday party was held when he was two years old and he enjoyed the attention he received that day. The party included two cakes made by Mrs. Guillot, a lion shaped cake for guests and a special meat cake for Leo. April 14 is still celebrated each year as a birthday for our live mascots. Leo II was born in early 1988 at a Texas safari ranch. He was originally named Moses and had a twin brother named Aaron. He came to UNA at 5 months old in July 1988. Leo II grew to over 600 pounds. He was named Second Best Mascot in America in the April 28, 1997 issue of Sports Illustrated. Leo II reigned over the 1993, 1994 and 1995 Division II National Football Championships. He died at Auburn University March 2, 2000, while undergoing tests. Una and Leo III were born November 18, 2002 at a wildlife refuge in New Hampshire. 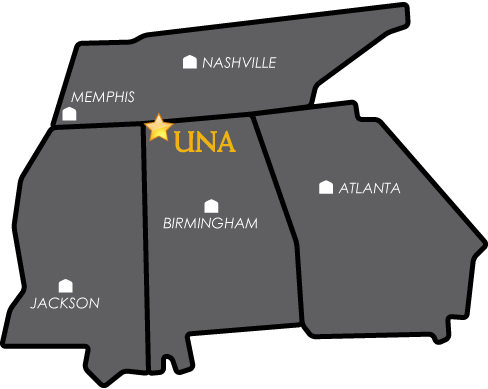 They flew to UNA when they were just 6 weeks old in a Learjet donated by a UNA supporter. They weighed 9 and 10 pounds respectively when they got here. In 2012 Leo III and UNA were ranked No. 1 of the 25 Best Real Animal Mascots in College Football by totalprosports.com. UNA was the only non-Division I institution to make the list, joining the company of competitive NCAA teams such as the Baylor Bears, LSU Tigers and Texas Longhorns. As of October 2017, Una weighs 320 pounds and Leo III weighs 476 pounds. We celebrate their birthday as close to April 14 as we can, because that’s when Leo I was born. Local veterinarians Dr. Randall Smith, Dr. Matt Connolly, Dr. Bill Connolly and Dr. Brandon Fisher are providing the finest medical care as a charitable contribution. Our Lion Habitat was built in 2002, funded by donations from David Carroll in honor of his late father George H. Carroll. It has both indoor and outdoor areas for the lions, along with a kitchen and service areas for the caretakers. The $1.3 million habitat was built based on AZA (Association of Zoos and Aquariums) guidelines and incorporates ideas from other zoo facilities our staff visited while planning the construction. The outdoor area includes boulders, streams, a waterfall and a pond. During the day, Leo III and Una are seen playing or sleeping in the outdoor portion of the habitat. The habitat has received 15 consecutive 100 percent ratings from the U.S. Department of Agriculture when they make unannounced visits for inspections. Mrs. Anne Howard is the primary caretaker for Leo III and Una. The wife of our former VP for Advancement, Dr. Dan Howard, Anne has been with the lions nearly every day since they were acquired by UNA. In 2002, Dr. Howard took a group of UNA administrators and staff to New Hampshire to get the two lions. Once he returned with Leo III and Una, Dr. and Mrs. Howard kept the lions at their house until they were large enough to move into the new habitat. Mrs. Howard loves to mention how she bottle fed them as babies and continues to feed them most days. She now leads their all-volunteer care team 6 or 7 days a week, often-spending 8 to 10 hours a day at the habitat. When Dr. Howard travelled for work after he left UNA, Anne stayed behind with Leo III and Una until he could return. Her daily tasks include cleaning the habitat, interacting with the animals and preparing their food. Dr. and Mrs. Howard are often seen doing maintenance at the habitat or entertaining visitors with stories about the lions.